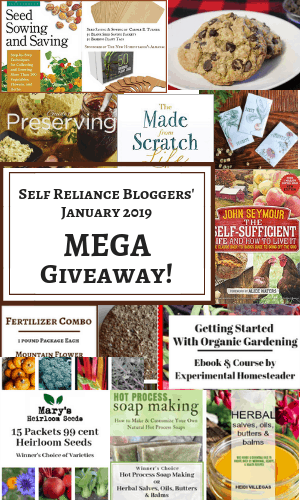 I mentioned two weeks ago that I was partnering with several other bloggers for a Self Reliance Challenge in January. It’s been a great time, and I love seeing what these bloggers post. They are geniuses and so creative! As part of the month long challenge, we are bringing you this mega giveaway with prizes worth almost $200! Keep reading to see what the prizes are, and if you haven’t checked it out already, take a look at the list of all the Self Reliance Challenge participants. The giveaway opened at 6am CST on January 14th, 2019, and it ends at 6PM CST on January 26th, 201. If you’re from Canada, don’t worry! 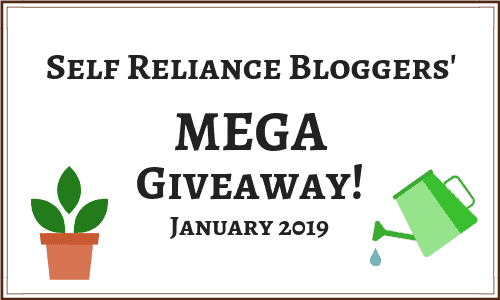 Our Canadian blogger, FarmGal who blogs at Just Another Day on the Farm, is holding a giveaway at the same time. You have different laws – BOO! – but FarmGal didn’t want you to be excluded! Check out her awesome giveaway. Follow Me On Pinterest for an Entry! Check all the other participants for their way to enter the giveaway!